Many Egyptian women hoped to make political gains following the country's revolution. But female candidates fared extremely poorly in the recent parliamentary elections. 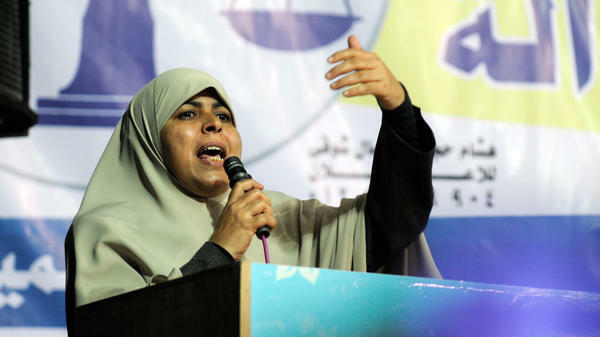 Here, Huda Ghaniya of the Democratic Alliance, an Islamist grouping, campaigns last Nov. 11. In Egypt's recent parliamentary elections, the first since Hosni Mubarak's ouster and the fairest in the country's history, Islamists won big. And one group suffered a shocking disappointment — women. Although the final numbers haven't been announced, it appears there will be only about eight women out of the 508 seats — or fewer than 2 percent. "I think it's a disastrous Parliament; how this can represent a society?" said Dalia Abdel Hamid, the gender officer at the Egyptian Initiative for Human Rights. "After the revolution everyone wanted to be represented and to have their voices heard but ... women are just being marginalized by all the parties." It's been almost a year since Egypt's revolution, and there's a feeling now that the heady days when men and women stood together in Cairo's Tahrir Square are long gone. In many cases, nascent democracies have a quota system to ensure that all groups get at least some level of representation. But in Egypt, a quota for women was viewed with suspicion. Many thought it might be used, as it was in Mubarak's time, to stack the Parliament unfairly. Also, the women who ran on party lists were placed far down on those lists, meaning they had virtually no chance of getting into office. And that was true of all parties, Islamist as well as liberal. "It really hurts so much when the same people you were with in that square that day, who are fighting against the regime ... are now turning against you," says Dalia Ziada, an activist who ran for Parliament. "It's like betrayal, betrayal from our companions." Like many Egyptian women, she was a victim of female genital mutilation as a child, which has led her to become an advocate of women's rights. But she found that changing attitudes toward women in politics is an uphill battle. "I tried to test how the society is thinking about women after the revolution," she says. "We went to three locations ... and we did a survey that was composed of only one question. Would you accept to see your president as a woman? One hundred percent of them said 'no.' This is what people think, it's OK to have democracy, but women are not in the equation of democracy." The roots of discrimination against women are deep in Egypt. Sexual harassment is not only pervasive, but it's used as a tool of political oppression. A YouTube video shows a recent attack on a female activist who had been publicly critical of the ruling military council. Thugs surrounded Nawara Negm, some screaming, "You whore, you sold your country." The video captures what is just the latest in a stream of assaults against women. And women's groups worry the situation may only get worse. Islamist parties, including hard-line Salafis who believe in forcing women to cover themselves from head to toe, will be the majority in the new Parliament and will have a significant role in crafting the constitution. Dalia Zaida, who wears a headscarf herself and is an observant Muslim, says it's a grave concern. "These people see women as evil, as the source of all vices," she says. "So they will try to suppress her in every way possible." Not so, says Omaima Kamel, who argues these are dangerous stereotypes about Islamist groups. She is a professor of public health at a university and also ran as a candidate for the Muslim Brotherhood's political party, the Freedom and Justice Party. You can be Islamist and also empowered as a woman, she says. She says the men voted into Parliament can safeguard women's rights through compromise. "You will find voices against hijab [the headscarf] and voices against bikini," she says. "All the time we accept the diversity, we accept the difference, but who can decide the path of Egypt? The moderates. They can make consensus." Yet Kamel was placed so far down on her party's electoral list that she probably won't be given a seat in Parliament. And when asked if a woman should be president? "I don't think so," she answers. "Egypt is a very large country and its problems are very, very deeply rooted. I think it will be difficult for her to carry this responsibility. Let men do the difficult job and we can [provide] support," she says. Well, now to Egypt, which is forming a new parliament. The recent elections there were declared largely free and fair, and Islamists won big. The vote delivered a stunning setback, however, to one group - women. Only about 1 percent of the new legislature will be female. As NPR's Lourdes Garcia-Navarro reports from Cairo, activists are deeply disappointed. LOURDES GARCIA-NAVARRO, BYLINE: Not only was there a dearth of women seeking office in the recent elections here, but the problem was no one voted for the ones who did. Although the final numbers haven't been announced, out of 508 seats, only about eight will be filled by women. Dalia Abdel Hamid is the gender officer at the Egyptian Initiative for Human Rights. DALIA ABDEL HAMID: I think it's a disastrous parliament. It doesn't reflect the society. It doesn't represent the society. And after the revolution, everybody wanted to be represented and to have their voices heard. But women, they're just being marginalized and - by all the parties. GARCIA-NAVARRO: Usually, in nascent democracies, a quota system is put in place in elections, to ensure that all groups get adequate representation. But here in Egypt, having a quota for women was viewed with suspicion. Many thought it might be used - as it was in Mubarak's time - to stack the parliament unfairly. DALIA ZIADA: It really hurts so much when you see the same people whom you were with in that square that day, fighting against this regime, are now turning against you - like betrayal from our companions. GARCIA-NAVARRO: Dalia Ziada is an activist here. Like many Egyptian women, she was a victim of female genital mutilation as a child, and that led her to become an advocate of women's rights. She also ran for parliament. She says people's attitudes need to change in Egypt. ZIADA: I tried to test how the society is thinking about women after the revolution. We went to three locations, and we did a survey that's composed of only one question, which is: Would you accept to see your president as a woman? One hundred percent of them said no. So this is how people think. It's OK to have democracy, but women - is not in the equation of democracy. GARCIA-NAVARRO: The roots of discrimination against women are deep here. Sexual harassment is not only pervasive, but it's used as a tool of political oppression. GARCIA-NAVARRO: This is YouTube video of an attack last night on a female activist who'd been publicly critical of the ruling military junta. Thugs surrounded and beat Nawara Negm, some screaming you whore, you sold your country. It's only the latest in a stream of assaults against women that have provoked shock and outrage. And women's groups worry the situation may only get worse. Islamist parties including hard-line Salafis, who believe in forcing women to cover themselves, will be the majority in the new parliament, and will have a role in crafting the new constitution. ZIADA: These people see women as evil, as the source of all vices. So they will try to suppress her in every way possible. GARCIA-NAVARRO: Not so, says Dr. Omaima Kamel. She says those are dangerous stereotypes. She is a professor of public health at a university here, and also ran as a candidate for the Muslim Brotherhood's political party. You can be Islamist and also empowered as a woman, she says. She says the men voted into parliament can safeguard women's rights through compromise. DR. OMAIMA KAMEL: You will find voices against hijab, and voices against bikini. KAMEL: And all the time, we accept the diversity, we accept the difference. But who can decide the path of Egypt? The moderates, those can make consensus. KAMEL: ...and we can support. GARCIA-NAVARRO: She says maybe the next generation of women will think differently. But this, she adds, is what I believe. Lourdes Garcia-Navarro, NPR News, Cairo. Transcript provided by NPR, Copyright NPR.